Constantin Lupulescu, the winner in Reykjavik. 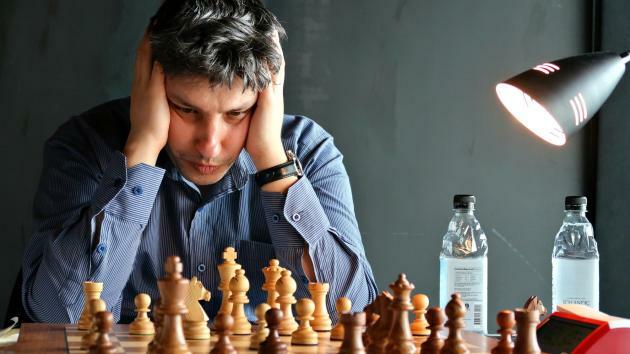 | Photo: Fiona Steil-Antoni/Reykjavik Open. We're picking up the tournament after five rounds, when the rising star Firouzja was sharing the lead with Armenian GMs Robert Hovhannisyan and Sergei Movsesian and the eventual winner Lupulescu. In round seven Lupulescu increased his lead to a full point with another win with the black pieces. This time he defeated Firouzja, who apparently isn't reading all the Chess.com news reports just yet! No fewer than 10 players were trailing the leader by half a point: Hovhannisyan (Armenia), Nils Grandelius (Sweden), 2015 winner Erwin l'Ami (Netherlands), Tigran Petrosian (Armenia), Gawain Jones (England), Sabino Brunello (Italy), Mircea-Emilian Parligras (Romania), 2016 winner Abhijeet Gupta (India) and IMs Kassa Korley (Denmark) and Quentin Loiseau (France). Can't remember the last time I had more fun watching a game than @GMGrandelius vs Gupta in the #ReykjavikOpen today. Immense tension building effort as black, followed by inspired sacrificial attack, all of it inhumanly difficult. Great brawl. Gupta vs Grandelius: a "great brawl." | Photo: Fiona Steil-Antoni/Reykjavik Open. In fact, he was on the verge of defeat against l'Ami but by holding this endgame, Jones made sure he will be a 2700 player in the May 2019 FIDE rating list. With this draw Jones joined the group on seven points, while l'Ami remained half a point behind. That group of seven points was as big as eight players, with Firouzja coming in second place on tiebreak and Lupulescu in first. Only deep in the endgame the Icelandic player stumbled after having defended nicely for so long. Firouzja's live rating, in case you're wondering, is now 2682.6.